Almost 35 years ago, the late Carl Sagan stared in a ground breaking TV series called Cosmos: A Personal Voyage. This series was, until PBS did one about the American civil war, the biggest watched show on the channel. We now have to jump forward to today, well actually yesterday. 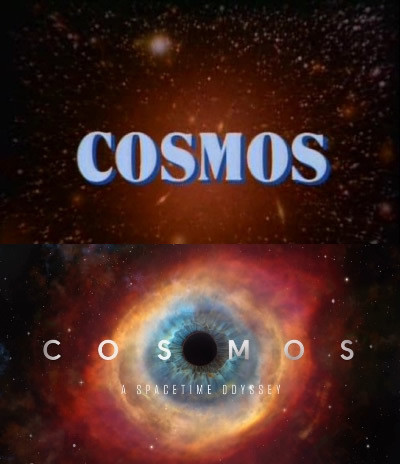 Cosmos is back. This time hosted by Neil deGrasse Tyson. Here in the UK, we are watching the series a week after it shows in America. Both on Sky 1 and the national geographic channel. The same channels that it airs in America. It’s just a pity that it isn’t on one of the free satellite / terrestrial channels. It’s perfect for BBC 4. I was quite late into watching the original series but was aware of it. I would recommend watching it just to see the wonderful ideas and how Carl Sagan got them across to a non-science audience. He draw you in with his wonderful comments. Its not only science, we also get his recipe for apple pie. This new version of that historic series has started in the same way as the original. The “cosmic calendar” is back so is Carl’s spaceship, waiting to take us around the cosmos. The major change in this new version is the historical features. Instead, as the original did, in historical dress but now as animated sequences. These vignettes were the best pieces of the series. A simple way of showing a potted history of a famous scientist. With these animated sequences, it does seem to put these parts into the background instead of making them a little magical. The effects in the new series are as ground breaking today for science as the original was all those years ago. I’m just waiting for some of the amazing effects in the original being used today. The Library at Alexandria sequence is one. From late 70s TV, and computer, technology to today. The first episode was bookended with comments about the original presenter, Carl Sagan. Either a small tribute about his work and then bridges into the new, or is it just an updated version? In conclusion, a great programming that needed an update. This time, we can see it on a mainstream channel that should bring back a love of science to a new generation.